We have been studying and developing an underwater robot for coral reef conservation. This paper describes the development of an acetic acid injection device mounted on an underwater robot for use in exterminating crown-of-thorns starfish that damage corals. First, we outlined the ecology and morphology of the crown-of-thorns starfish to identify requirements for the acetic acid injection device. Based on the requirements identified, we designed and prototyped an acetic acid injection device to be installed on an underwater robot. 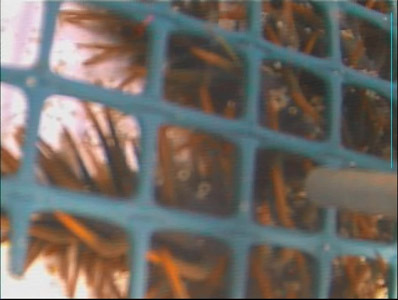 Next, we installed the developed injection device on a remotely operated vehicle and injected acetic acid into crown-of-thorns starfish under water. We describe the effectiveness of this acetic acid injection device for exterminating crown-of-thorns starfish. The experimental results prove that the developed acetic acid injection device can inject acetic acid into crown-of-thorns starfish just as intended, and that an underwater robot installed with such device can be used effectively to aid in the extermination of crown-of-thorns starfish. Full text (2.0MB) (free) Please log in. F. Takemura, S. Kobashigawa, K. Hirayama, K. Kawabata, S. Sagara, H. Yamashiro, and E. Kuraya, “Development of an Acetic Acid Injection Device for Crown-of-Thorns Starfish Controlled by a Remotely Operated Underwater Robot,” J. Robot. Mechatron., Vol.27, No.5, pp. 571-578, 2015. Ministry of the Environment, “Annual Report on the Environment, the Sound Material-Cycle Society and the Biodiversity in Japan 2012,” pp. 76-77, 2012. D. Bryant, L. Burke, D. J. W. McManus, and M. Spalding, “Reefs at Risk,” World Resources Institute, p. 20, 1998. Nature Conservation Division, Okinawa prefecture, “Coral reef resources intelligence readiness project – Report on coral reef resources investigation project, around main Okinawa island –,” pp. 69-120, 2010 (in Japanese). Kuroshio Biological Research Foundation, “Crown-of-thorns Starfish Control Manual, Introduction to the acetic acid injection method,” 2012. S. Ohyama, T. Nohara, T. Yusa, O. Kakinohana, J. Takeda, and H. Sato, “A Study on SCUBA diving of local fishing community in Okinawa,” J. of Health and Human Ecology, Vol.46, No.3, pp. 130-138, 1980 (in Japanese). F. Takemura, S. Futenma, K. Kawabata, and S. Sagara, “Experimental Verification of Lifting Force by an Underwater Robot with Thrusters Having the Passive Posture Maintenance Mechanism,” J. of Robotics and Mechatronics, Vol.25, No.5, pp. 812-819, 2013. F. Takemura, R. T. Shiroku, K. Kawabata, and S. Sagara, “Development of Easily-Removable Underwater Manipulator Unit with built-in Controller,” J. of Robotics and Mechatronics, Vol.25, No.5, pp. 778-784, 2013. K. Yokoi, M. Kawabata, S. Sakai, S. Kawamura, N. Sakagami, S. Matsuda, A. Mitsui, and K. Sano, “Improvement of a Human-portable Underwater Robot for Soil Core Sampling,” Proc. of OCEANS MTS/IEEE 2014, St. John’s, Newfoundland, 140326-187, 2014. N. Sakagami, M. Shibata, H. Hashizume, Y. Hagiwara, K. Ishimaru, T. Ueda, T. Saitou, K. Fujita, T. Inoue, H. Onishi, S. Murakami, and S. Kawamura, “Development of a Human-Sized ROV with Dual-Arm,” Proc. MTS/IEEE Int. Conf. on OCEANS, 2010. Y. Taira, S. Sagara, and M. Oya, “A Robust Controller with Integral Action for Underwater Vehicle-Manipulator Systems Including Thruster Dynamics,” Proc. of the 2014 Int. Conf. of Advanced Mechatronics Systems, pp. 415-420, 2014. J. Kim, S. Jin, J.-W. Kim, J. Kim, and T. W. Seo, “Optimal Design of Geometric Parameters of a Four-Bar Based Manipulator for an Underwater Robotic Platform,” Int. Conf. on Control, Autimation and Systems, pp. 1490-1493, 2013. T. Naruse, “Development of Bottom-Reliant Type Underwater Robots,” J. of Robotics and Mechatronics, Vol.26, No.3, pp. 279-286, 2014. A. Kume, T. Maki, T. Sakamaki, and T. Ura, “A Method for Obtaining High-Coverage 3D Images of Rough Seafloor Using AUV – Real-Time Quality Evaluation and Path-Planning –,” J. of Robotics and Mechatronics, Vol.25, No.2, pp. 364-374, 2013. Y. Nishida, T. Ura, T. Nakatani, T. Sakamaki, J. Kojima, Y. Itoh, and K. Kim, “Autonomous Underwater Vehicle “Tuna-Sand” for Image Observation of the Seafloor at a Low Altitude,” J. of Robotics and Mechatronics, Vol.26, No.4, pp. 519-521, 2014. T. Yamamoto and T. Otsuka, “Experimental validation of dilute acetic acid solution injection to control crown-of-thorns starfish (Acanthaster planci),” Naturalistae, Vol.17, pp. 63-65, 2013. Nature conservation division, Cultural environment department, Okinawa prefecture, “Story of crown-of-thorns starfish,” pp. 1-8, 2003 (in Japanese).